Mesut Ozil has today been linked with a move to Paris Saint Germain after failing to impress Unai Emery who became the new coach of the gunners in May. 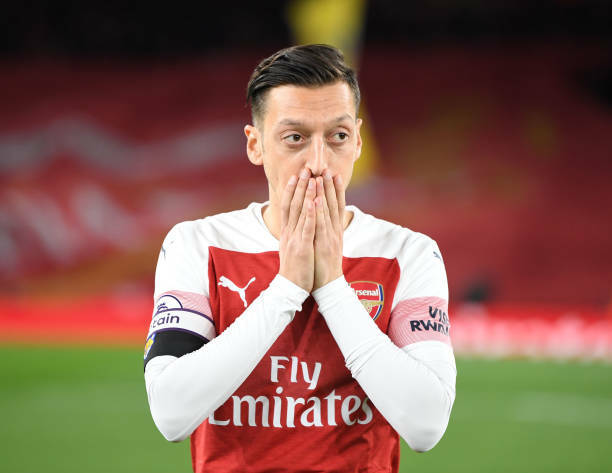 Arsenal midfielder Mesut Ozil signed a new deal last year in January but he has however found chances limited at the Emirates Stadium this season under Unai Emery. It’s now reported that Paris Saint Germain were interested in signing him on a loan deal but he has however rejected their offer. Mesut Ozil has not got enough playing time in the last few weeks because of the injury which he sustained before Arsenal’s match against Liverpool but he recently returned to full training but Arsenal boss Unai Emery omitted him from the squad that played vs West Ham United a few weeks back. PSG is currently in a tough position because Neymar has been ruled out for two months and he will miss their UEFA Champions League round of 16 matches against Manchester United. German newspaper Suddeutsche Zeitung has confirmed that Paris Saint Germain made a move for Mesut Ozil but their interest in him was immediately rebuffed by the player himself because he wants to stay at Arsenal and he has always spoke of how he loves the London City & its weather. It is going to be an interesting day because the transfer window’s closure is now down to hours and most of the Premier League clubs and those abroad are working hard to get their transfer targets but as for Mesut Ozil, the Emirates Stadium is still his home until further notice.